You Are My Licorice: Life as I know it is over. Kaia stopped napping last fall at her babysitters and since the beginning of the year she has stopped napping at home. *Cue fat mommy tears*. What we do instead is that for an hour in the afternoon Kaia has 'quiet time' in her bed. I put her in her crib with some milk and books and she sits and talks to herself and drinks and 'reads'. I hear her chatting away on the baby monitor. She (mostly) doesn't complain about this, so I'm going to keep it going AS LONG AS POSSIBLE. Brian however has been talking about converting her crib to a toddler bed (I know, we're way past due) so I'm wondering if this is going to screw up quiet time once she realizes she can just get up. I feel you on the having to be 'ON!!!" from morning to night. We have watched way too much TV this winter due to crappy weather and Mommy just not being able to entertain ALL DAY long. 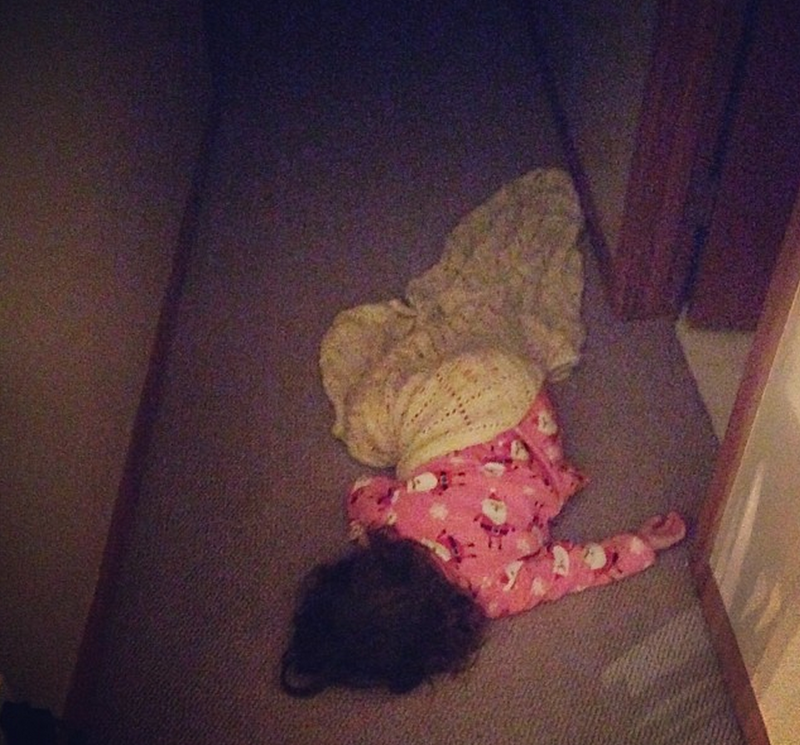 I say if Carys is comfortable in the hallway and sleeps and it doesn't bother you, then who cares? All toddler weirdness is only temporary! She's sleeping. its a win. Beds are a man-made thing, there is no law of nature that people sleep in a bed. You are a good mommy. Thank you for being so brutally honest... and thus hilarious. There is nothing more enlightening and refreshing. We all struggle. We all want to be great parents. We all want NEED "me" time. There are undoubtedly more children sleeping in unconventional places (and still thriving) than we realize. Parents used to put babies in drawers rather than cribs, right? Go with it! This will be the first comment ever posted! (Funny because I read your blog everyday for my last three month of pregnancy, which sounds... just plain creepy, but it was super helpful. Especially your hospital bag, I left out everything c-section related and then needed an emergent c-section! Now back to the point!) I feel like it's a win. You are encouraging individuality. My 2 month old recently decided he doesn't like naps that last longer than 5 minutes (then cries in my face because he doesn't understand why he feels bad I imagine).